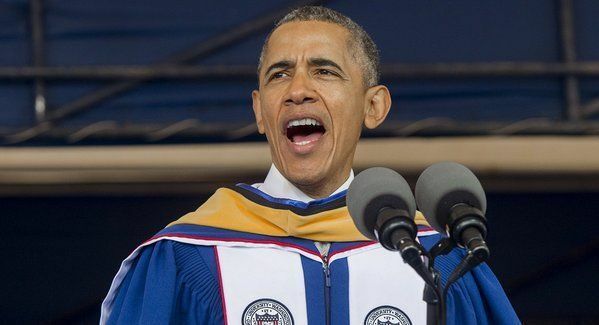 Obama told black college graduates at historically black Howard University on Saturday that good luck kept them from being drug dealers. What an a$$hole. Not hard work and sensible choices — but GOOD LUCK — kept them from dealing drugs! Wow! That has to rank up there with one of Obama’s all-time insulting remarks. Tell us what you really feel. Once again – could you even imagine if a Republican would have said that to a group of black graduates! This passage that raised eyebrows over at The Weekly Standard. Barack Obama: We can’t walk by a homeless man without asking why a society as wealthy as ours allows that state of affairs to occur. We can’t just lock up a low-level dealer without asking why this boy, barely out of childhood, felt he had no other options. We have cousins and uncles and brothers and sisters who we remember were just as smart and just as talented as we were, but somehow got ground down by structures that are unfair and unjust. And that means we have to not only question the world as it is, and stand up for those African Americans who haven’t been so lucky — because, yes, you’ve worked hard, but you’ve also been lucky. That’s a pet peeve of mine: People who have been successful and don’t realize they’ve been lucky. That God may have blessed them; it wasn’t nothing you did. So don’t have an attitude.